The older I’ve gotten, the more I realize just how important it is to be comfortable, especially away from home. Before, I opted to wear the cute outfit for the ‘Gram, but would sacrificed being comfortable for the sake of the photo. Little did I know that if I didn’t feel good, I probably didn’t look that great in the first place. Plus, a lot of the time those cute outfit inspos require a lot of additional pieces that weigh down suitcase and take up some prime souvenir real estate. 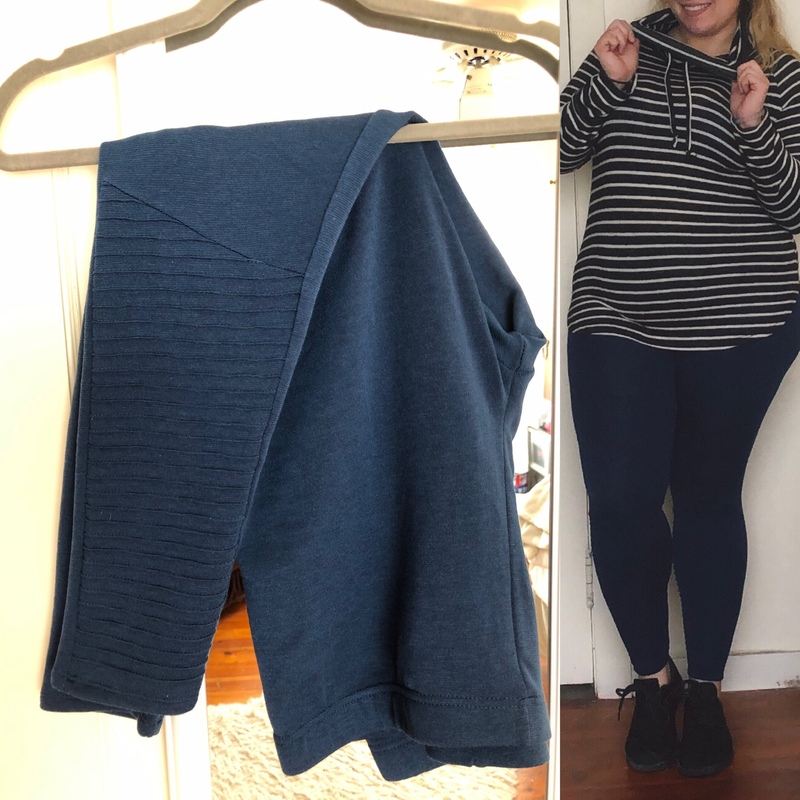 With our upcoming adventure to Prague and Budapest, I asked for Caitlin to send me some athleisure pieces to keep me chic, but more importantly comfy. 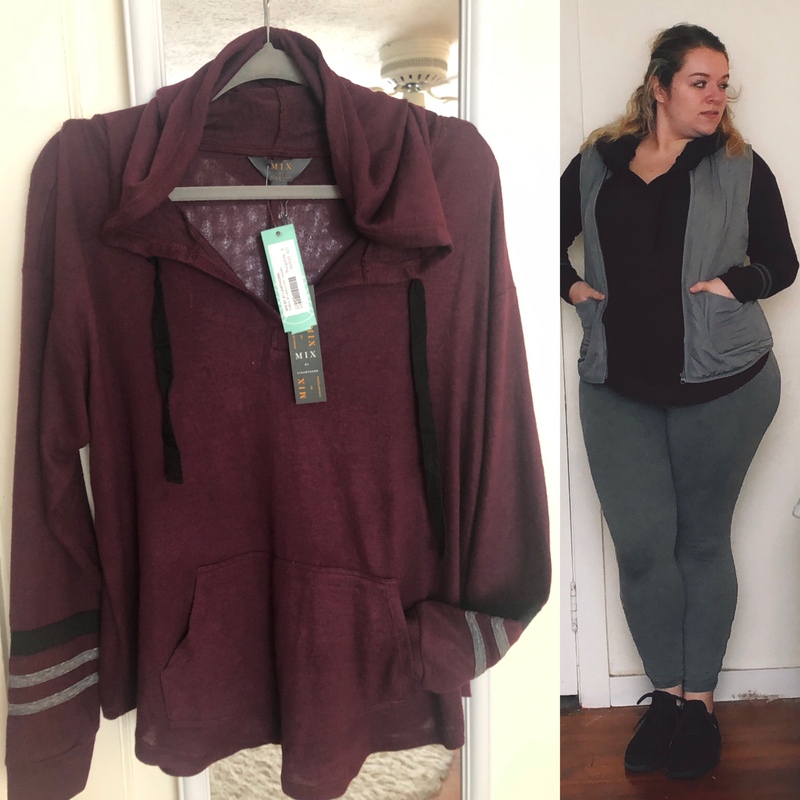 I’ve been all about the athleisure lifestyle lately, even though I haven’t been to the gym in a solid month (thanks to a lingering sprained ankle…). My stylist Caitlin knows my fashion sense ten-fold and she hooked me up with some great basic layers to keep me warm while we explore and some breaking-the-norm pieces for me to step out of my comfort zone in foreign territory. 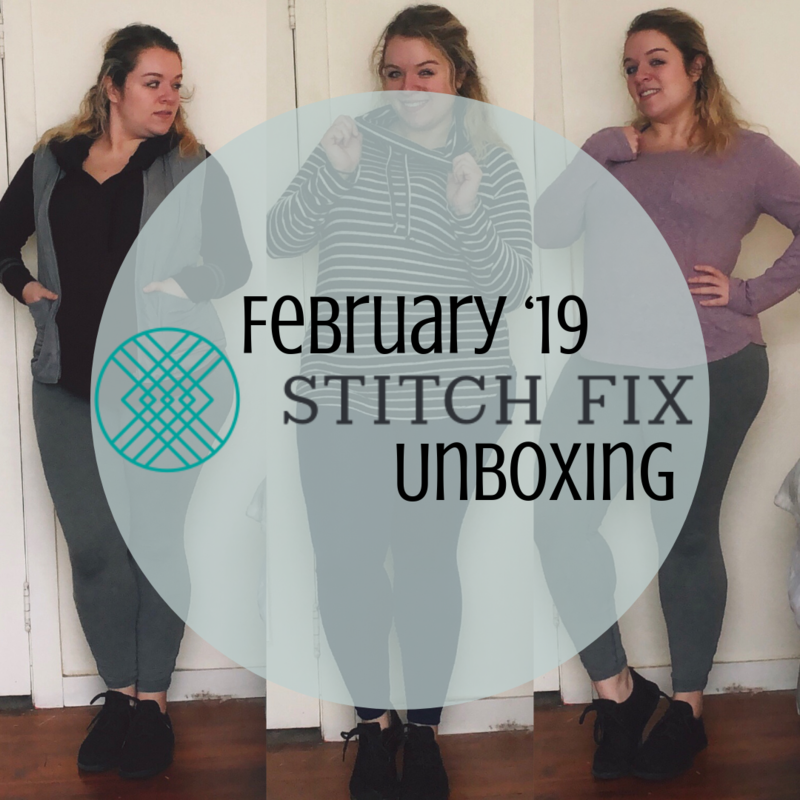 Everything in this month’s Fix subtotaled to $138.25, including the Buy All discount and styling fee purchase credit. That makes this my cheapest Fix ever! Just because it’s the cheapest doesn’t mean the pieces feel cheap, but rather, they’re wardrobe builders that will go beyond my travels. Predictability isn’t necessarily a good trait to have, and Caitlin is trying to break me of my predictable black leggings. She even called me out on it in the stylist note card! She understands that I need a nudge into trying something new, so this denim-esque blue legging is a baby step in the right direction. 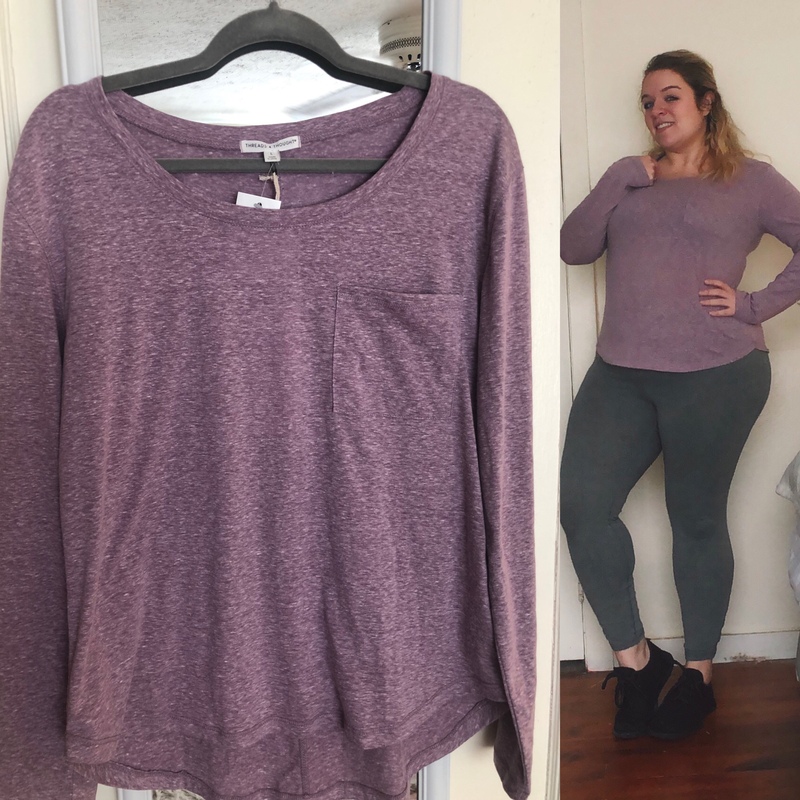 Admittedly, I feel like I’m overthinking this color because it does resemble a denim, but the fact that they’re leggings is playing with my mind and making it difficult to pair with pieces. I am obsessed with the ribbed detailing because it makes them look edgy while retaining their comfort. These are going to be a great grab for those long days walking around and exploring while indulging on some local cuisine. Caitlin suggests keeping these more casual with sneakers and pullover. The best way to make an outfit more pieced in my opinion is to add a vest. It also adds a layer of insulation, so double win. When I peeped this in my Fix, I was really excited. 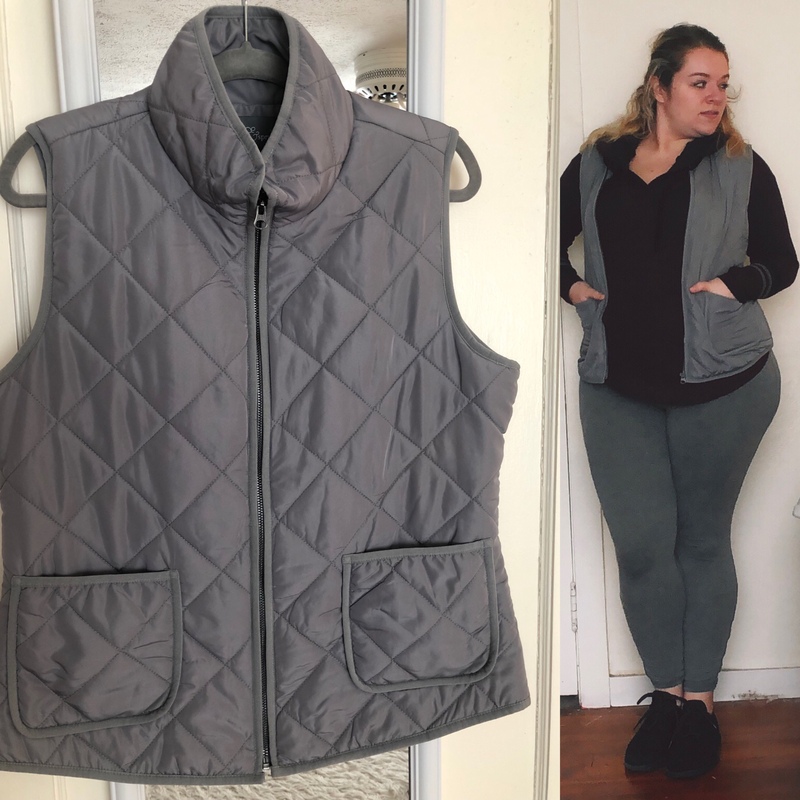 I’m picky about quilted vests because sometimes they’re too puffy and thick, but this one is the perfect blend. The grey color is a great addition to my already neutral collection and something I could totally see myself incorporating as much as possible. I wanted to exchange this vest for a bigger size because it was tight across the chest and I couldn’t really zip it. However, they only had a medium available, so I decided to just keep it and use it as some sort of fitness inspiration. Plus, I don’t always zip my vests over big sweaters, so it wasn’t a total dealbreaker. Since it’s such a neutral, this can be worn with a lot of things. Grab a chambray shirt and olive jeggings and some booties or a striped sweater and jeans. Brushed knit has been a staple lately and this one is no different. I’m vibing on how cozy this sweater is and how it’s not too heavy, making it the perfect companion on a long flight. I really like this top because I’ll get a lot of bang for my buck with this. If I really wanted to, I could opt to wear this to work on those days I’m just not feeling my best and just want to lounge in a hoodie. In the same breathe, I can wear this with a pair of jeans and run some errands. While traveling, I’m always opting for multi-purposeful pieces to take up less room in my suitcase. This hoodie not only provides my hair protection from a stray rain-shower, but it acts as another layer for those brisk days walking around the town square. This hoodie is definitely not intended to be a sole layer of protection, but rather a building layer under the aforementioned vest or a leather jacket. The subtle detail on the wrists give it that athletic vibe and changes up an othewise basic hoodie. This is why I wholeheartedly trust Caitlin with my style. This isn’t a piece that I would go out of my way to try on in store, but with someone else’s recommendation, I really like it on. I never would envision trying it on my own, but sometimes you need another perspective. 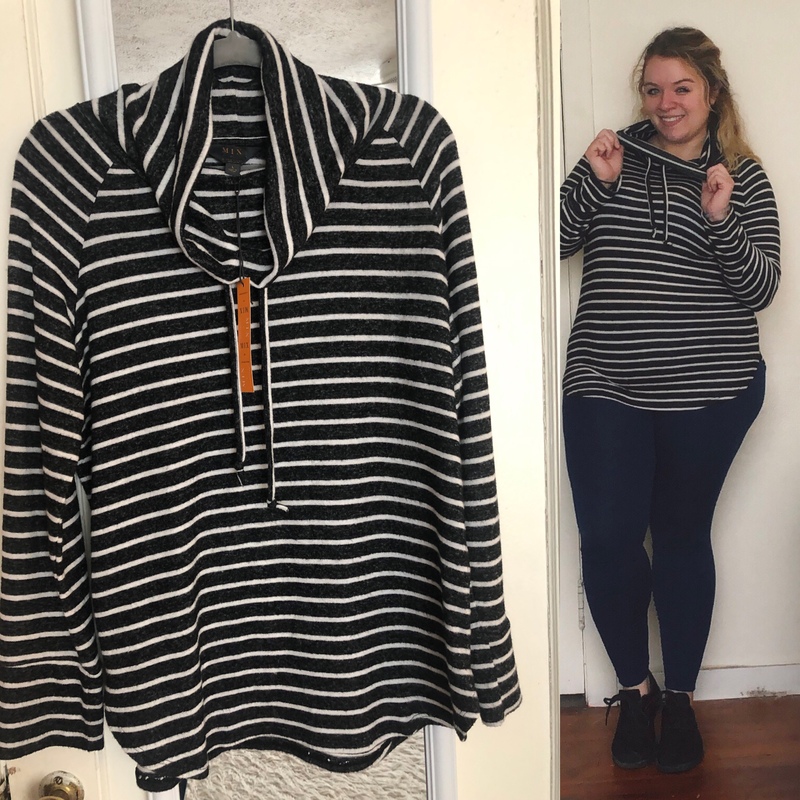 On my style card, this sweater also appears to come in a hunter green color but I think Caitlin’s suggestions would still work. She paired this with floral leggings, a leather jacket and sneakers or a pair of jeans and striped duster cardigan. You might remember over the summer where I had a change of heart and was stepping out of my anti-purple stand. Caitlin decided it’s time to try it again. The color isn’t exactly purple, but it’s still something that’s out of my norm. However, I do like it because this triblend reminds me of a hoodie I had from Aerie EONS ago that was a favorite. Even though this is a basic top, I like the pocket detail since it changes the cut and fit of it. Caitlin suggested this with a pair of Nike leggings and sneakers or jeans and slip-ons. This entry was posted in fashion and tagged Athleisure, Brushed Knit, casual fashion, chic, clothes, clothing, fashion, fashion blog, fashion blogger, fashion diaries, fashion gram, Fashionista, fblog, fblogger, fbloggers, Hoodie, InstaFashion, leggings, lifestyle blog, Look Book, Market & Spruce, MIX BY 41 HAWTHORN, Moto Ribbed Legging, OOTD, outfit inspiration, outfit inspo, outfit of the day, outfits, Plus Size, sarah lokker, stitch fix, stitch fix unboxing, style, Style Book, Stylist, T4T, Threads 4 Thought, top, Travel Fashion, try on, Vest, Winter Fashion. Bookmark the permalink.